Once without hope or support, Amina’s story is one of renewed health, hope, and the journey to self-sufficiency all possible through the mission of Ethiopia ACT! 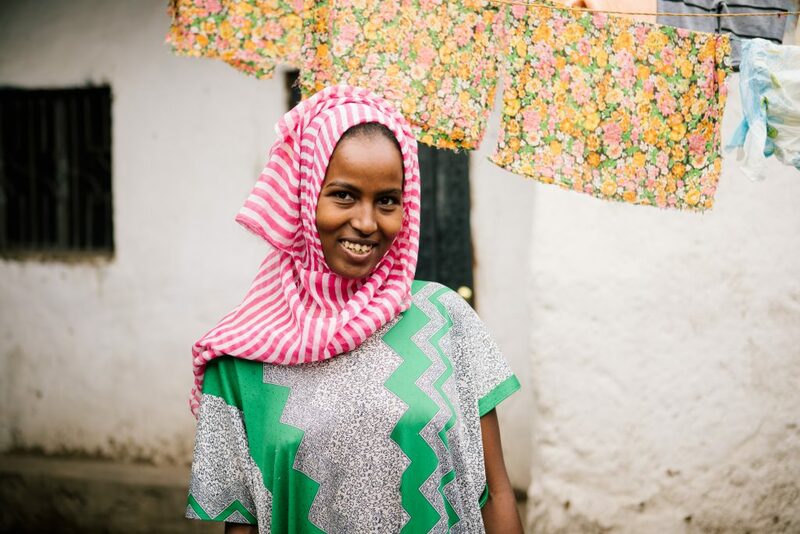 Twenty-one year old Amina was recently accepted to the Ethiopia ACT program. She was referred from local government office due to her dire economic need. When she was a little girl, Amina fell badly and injured her right leg and did not receive proper medical care which caused a lifelong disability. Amina later moved to the Suki community to live with her brother where she faced very difficult circumstances with very little support. She met a man with whom she had an affair, became pregnant but sadly miscarried multiple times which in turn affected her health. Eventually Amina married and she and her husband ran a successful business selling small clothing items on the street, but the government discovered it was not a legal business and took all their capital. After mourning her multiple miscarriages, she gave birth to a baby girl! However, her husband who was the only provider for her family unexpectedly left her without support. Amina faced the hardest experience of her life, as she has been unable to work to support herself and her daughter. Both Amina and her newborn baby were severely affected by malnourishment. There was no one for her when she was brought to Ethiopia ACT. Upon acceptance to the project, she was given food and rent subsidy that significantly helped her restore her health and hope to live like other people in her community. As a new beneficiary to Ethiopia ACT, Amina is so hopeful to be a self-supporting woman for her and her family once again by one day restarting the business she once had through the support she is receiving from Ethiopia ACT! David Thomae on What are Basic Income Grants? Kayla Dean on What are Basic Income Grants? Irene Villarreal on What are Basic Income Grants?